Professional wrestling had it’s beginning in the early 1920’s. Since it’s inception professional wrestling was a choreographed and “fake” event and is and has always been a “performing art”. You may refer to it as violence and due to it’s graphic nature there is a substantial level of violence perceived within each episode. But when we talk about violence It's important to understand what is violent and how the shows portraying these rambunctious actions are different than the real thing. Violence: the use of physical force to harm someone, to damage property, etc. : great destructive force or energy. Although the process of this performance art is graphic, it is seldom violent. There is no great destructive force, no harm to most of the participants and no real destruction of property. Remember, it is performance art, similar in many ways to the sports we watch, similar to the games our children play on their computers and similar to the way our kids used to play with each other before the introduction of video games. When President Donald Trump reposted the GIF of his past performance between Vince McMahon (with the CNN logo placed over McMahon's face) CNN went ballistic. Was it in good taste? Was it funny? Was it appropriate or timely? The answer to these questions depends almost entirely on your present ideology, with conservatives comparing the “event” to over the top shenanigans dutifully created by the likes of Hulk Hogan and Dwayne Johnson (the Rock) and all the others who are “professional” wrestlers. If the argument is to ban violence then I could understand their reasoning and actually empathize with their position. If the argument is only to curtail the video due to it’s embarrassing portrayal of the left and their hyperbolic sensitivity and their hypocritical stance on the violence supported and condoned by the left (CNN) then I would continue to remind them that the video was not violent, brutal or sadistic, unlike the riots on college campuses of late, the shooting of a Republican congressman or the rhetoric that threatens the lives and freedoms of all those who must endure the daily onslaught against our President and his ideology. We have taken a paradigm shift away from the way it used to be, civil and polite to chaotic, rude and decidedly uncivilized. The problem is that the left has skewed their own minds into thinking that they truly need to force their issues and demand their “rights” based on how it used to look and feel to them. Their self inflicted wounds will only continue to fester and eventually, like a gangrenous and infected hand, untreated will demand the entire body, sacrificing that body (the nation, other peoples rights, society in general) to the psychosis that they are right and the Right is wrong. When they cannot see the similarities in their rhetoric, or their actions with the performance art of the video then it must be concluded that they are, in part, psychotic and cannot see that their emotions and their thought processes have been compromised to the point that their ability to understand the obvious external reality has ceased to function. The same is true to a lesser degree with the Republicans. This creates an interesting dilemma of consciousness. If I know that my ideology is marginalized by the very party that I belong too and I know that the same is true for the other parties as well, how can I in good conscious promote one over the other? Is it simply by virtue of hoping for less evil or is their a way to actually change the outcome for a truly representative leadership, leaders who act responsibly and morally for the benefit of those they serve? A lofty dream perhaps but one that we should all entertain and strive to accomplish. To some degree I believe President Trump is governing according to his beliefs and trying to accomplish the promises made that got him elected. I don’t have to agree with all he does, all he tweets or in the process he takes to accomplish his goals but I do, we all should agree that he is our President. Trump is obviously not a politician and he has taken the fight that has been taken to him with an in your face strategy, that to many, including me, has been effective and welcome. 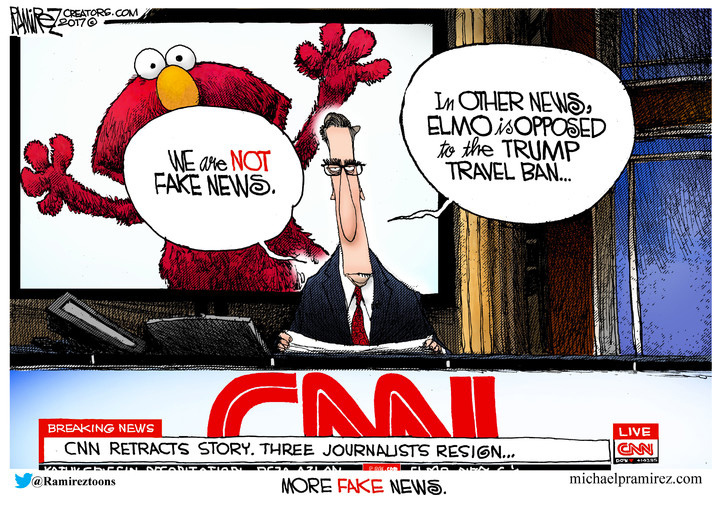 It is not my place to tell him how to run his affairs, nor is it the place of CNN, they should lean from this latest scuffle and move back to honest reporting, if they ever, really knew how.